People who use Windows 7 have become very fond of the “snap” feature. What it allows you to do is drag a window to the right edge of the screen and when you let go, it will fill exactly the right half. Drag it to the left side and it will fill the left half. Drag it to the top and if will take up the whole screen. This is an extremely useful tool, that has finally bridged to Mac. The app that does this is called Cinch. Now everything I described up there, it does. Simple, right? All you have to do is drag and let go. What would you use this for? Here are a couple of ideas. When doing research, you could have a web browser on the left side and an open document editor on the right. that way you can se the research information and type it up in your document all at the same time. Another use is moving files. 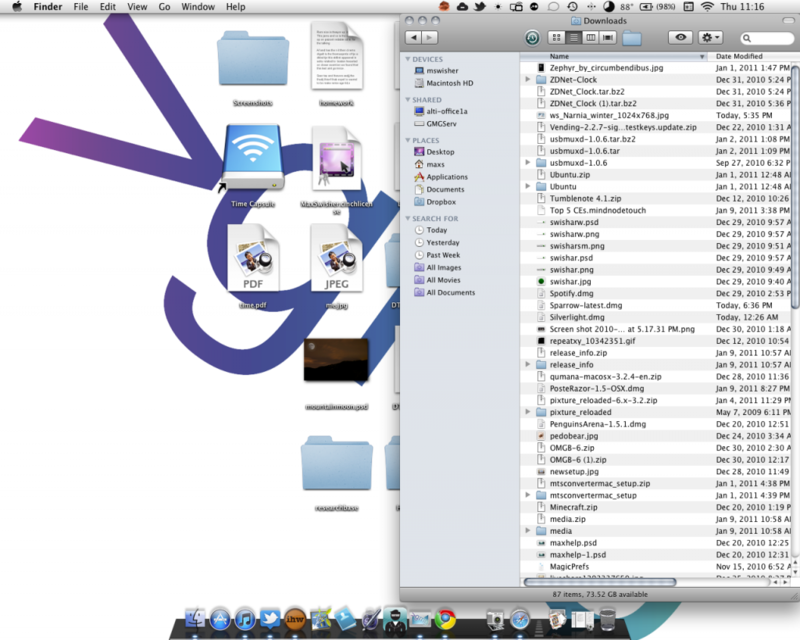 Drag one browser to one side and one browser to the other, and move your files inbetween. Move one terminal window to one side, one terminal to the other. Now this doesn’t work for windows that aren’t resizable, but it does work for pretty much every other app. You can get a demo of this for free here (which will show a pop-up every once in a while) or you can buy the full version for a mere $7. Enjoy! This entry was posted in Paid Apps by Max Swisher. Bookmark the permalink.